Hi folks! I’m Ron Miksha and I write most of the stuff you’ll read here on The Bad Beekeeping Blog. I was a commercial beekeeper for a dozen years or so, then became a hobby beekeeper when I got a real job later in life. I’ve kept bees in Pennsylvania, Saskatchewan, Florida, Wisonsin, and Alberta. And opened hives in half a dozen countries and three continents. But none of this means that I know much about bees. Use advice and ideas you find here with caution. Bees are unpredictable, climates and locales vary, and some of what you see here might not even be legal in your backyard. I live in Calgary (Canada) and I’ve been posting my musings and nonsense to the ‘net for over 20 years. Hope you find something you like here. This site, the Bad Beekeeping Blog, is slowly replacing badbeekeeping.com – an old beekeeping site I built long ago. My intention is to move most of the old pages here. Eventually. Someday. Maybe. Meanwhile, this WordPress site is the place to bee. I’ve had a bit of feedback that the old site doesn’t play well on devices other than PCs and laptops, hence this migration. The old site, badbeekeeping.com, has been around ever since the internet was discovered. (Actually since October 1995.) and there are a lot of goodies still sitting over there. The site was originally named The Beekeeper’s Home Pages and sat on Compuserve. I built my own domain and for a while housed it on an old machine in the back room. I kept dragging the content along whenever things changed, as it appears I am doing once again. 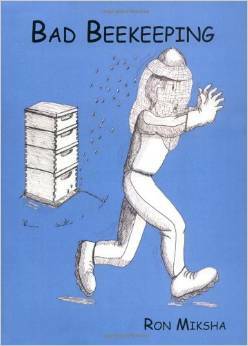 If you like what you read here, you may also like my book, Bad Beekeeping. It’s a story about keeping a few hundred hives and hauling them around North America, chasing the blossoms of apple trees, orange trees, alfalfa, and clover. In the book you’ll meet an elderly lady from Illinois who grew citrus crops in Florida (and went to school with Ronald Reagan), a native Cree cowboy who ranched in Saskatchewan (and had sons playing in the NHL), and a whole group of people who dressed in black and farmed together in one huge colony (and sang country songs in the evening). You will also meet a lot of other folks – and you may even learn a bit about beekeeping. Hope you’ll enjoy it! Hi. We are from Azerbaijan. We have boxes of bees. We’re producing honey. We want to cooperate with you. Honey high quality. Can you help us for sale honey? I can not help very much with your honey sales because I do not buy and resell honey. However, honey packers regularly read these pages and maybe someone will respond. I do not want to publish your e-mail address on-line, but if a buyer is interested, they can comment here. Most buyers will want to know the following: What is the honey colour (Pfund scale) and moisture? What is the floral source? How was the honey graded and labeled for export? What volume of honey to you offer? Do you have an export history? Please note that the world price of honey is now very low. According to the December 2016 American Bee Journal (using US import data from the USDA), Americans are buying Vietnamese organic honey at $1.58/kg; Ukraine sunflower white at $1.94/kg; Argentine white honey at $2.01/kg. thank you for answer/ I want to say that our honey cost about $10/kg becous it is very high quality. The color of honey is yellou like to red. Floral source is different. We are thinking for 0.5 kg or 1kg in the glass. Our export experiens very small. It sounds like you have a very nice product! Hopefully someone will see this and order it from you. Enjoy your blog. I am a member of the Calgary and District BeeKeeping Association. I read once that you do Bee Keeping presentations for school children, is this correct? I teach a grade 5 class and I started to prepare a presentation for my students to teach them about the fascinating world of beekeeping when I came across your blog about your presentation. It is clear your beekeeping experience is more robust than mine, would it bee possible to schedule a visit ? I would like to personally congratulate you as your Bad Beekeeping Blog has been selected by our panelist as one of the Top 60 Beekeeping Blogs on the web. I personally give you a high-five and want to thank you for your contribution to this world. This is the most comprehensive list of Top 60 Beekeeping Blogs on the internet and I’m honored to have you as part of this! Thanks. We appreciate the listing. Firstly, congratulations on the amazing things you do for the bees and your contributions to the beekeeping communities around the world. You’re one inspiring beekeeper. My name is Rich, a member of the Beekeeping Apprentice team. We, at Beekeeping Apprentice, are passionate about anything bees. We have an Online Beekeeping Course and Facebook Community for Beginner Beekeepers to learn and interact with other fellow beekeepers. It is designed to support hobbyists in their beekeeping journey. We aim to spread awareness of the importance of bees and leave a legacy on our ailing planet. It is our ultimate goal to contribute more to the beekeeping community all around the world and educate more people about bees and how beekeeping can alleviate the dire needs of our ailing planet. Thanks for the kind words and for sharing your links! Hi Ron, Thank you very much for you web site. Very interesting. I have currently access to wild organic honey produced in a protected forest in Sumatra (Indonesia) and would like to exchange with you about this product. New in this industry could we have have a chat together? It would be priceless for me to discuss with you and share your point of view about the honey industry. I’d like to know more about the organic honey. But what do you mean by ‘wild’ ? Was it collected from feral colonies or from managed hives? What is your role? Are you are beekeeper or a honey broker or some other role? Hi Ron, thank you for your reply here. What i am calling wild honey is a raw unprocessed honey from a protected forest (National Park) in Sumatra (Indonesia). My role here is to help a local producer to export this honey abroad. We are about to make some lab tests in Germany and hope to find buyers out of Indonesia. The production is not huge about 2 tons a month. Please let me know if you need more details and wish to discuss more. You are off to a good start. The lab analysis is necessary for export. If the honey is organic, you will have a valuable product. If not, the honey might be sold locally as a nice domestic product. I am not a broker or packer of honey, but some of the readers of this blog are – they can send me a note if they are interested in your Sumatra honey. Great stuff and thanks for your insights! I have some questions regarding this the honey “industry” can I send you a private email? I’ll send you a note when I get a chance. I would be interested to learn more too. How can we connect? Hi Henry where can i contact you ? Hello Ron, I’m a beekeeper from Italy. I’m about to start a blog where I plan to translate articles written by beekeepers from other countries to Italian, in order to allow those who can’t speak English to access valuable information. Your blog has been one of my favourites since I found it, and would like to ask you if you would allow me to translate your articles. I couldn’t find an email address or another way to contact you, but if you like the idea I will gladly give you more details privately. I wish you all the best and thank you for the good work you’re doing. Thank you for the kind words and your interest in translating some of the Bad Beekeeping Blog into Italian. Contact me (which you did), acknowledge the source when you reuse the work (i.e., from Ron Miksha at badbeekeepingblog.com), give a link back to my site as part of your credits (badbeekeepingblog.com), send me a link to your translation, and be careful that you do not misquote or take part of the article out of context or change its meaning. Please be careful with copying my pictures. Most photos on my blog were either taken by me (or family members) or they are public domain pictures – however it sometimes looks like a picture was released to the public when, in fact, it was not. Almost everyone is OK with an occasional mistake (especially if you give them credit and link to their source), but some folks are extremely sensitive and may even start legal action. When in doubt about a picture or other material, send me a note and ask about it. That sounds like a lot to do, but basically it’s this: ask first, be fair, give credit, and be careful. I will send you a private note so that you have my e-mail address for further correspondence.